Surfing was always something that appealed to me – I loved the idea of it, the culture, the fashion – when I was younger I often wore surf-style clothing. But when I was diagnosed with retinitis pigmentosa (RP) at the age of 19, I accepted that it was something I would never be able to physically do. I went travelling in my mid-twenties, and visited popular surfing spots in amazing locations such as Hawaii, California and Australia. I sat on the beach, longing to take part, but feeling that it was something so far beyond my capability as to be impossible. Then, four summers ago, my husband suggested that we go down to a beach in Broadstairs with my nephew, hire some equipment, and see whether there might be a way to make it work. We put on wet-suits, picked up our boards and walked out into the surf. It only took me two sessions to be able to stand up on the board and ride a wave, and from that point on I have never looked back. In those early days, my husband and nephew would position themselves either side of me, walking me out towards the horizon, telling me when to turn around and talking me through the waves as they approached. Often, when it was time to catch a wave, my husband would shout ‘Nalu’, which is the Hawaiian word for wave. As time when on, I found that I no longer needed help and could surf completely independently. You get a feel for the ocean, and I instinctively know how and when to turn and catch a wave. I have found surfing to be one of the most therapeutic activities I do. Quite apart from the health benefits of fresh air and exercise, there is a feeling of freedom when I’m riding a wave that I don’t get anywhere else. Rushing through the water with no obstructions in your way is an incredible feeling. I also enjoy bobbing around in the ocean waiting for a wave. Those of you who read my previous blog post about mindfulness will know how important I think it is to be present in the here and now, and being in the ocean simply waiting for that next wave is a great way to focus the mind. You may want to give surfing a go yourself. 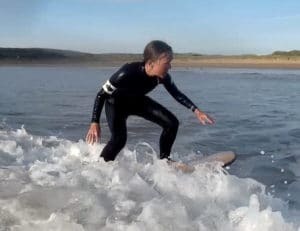 I would recommend arranging lessons with a professional to begin with, and it is important to take safety advice and precautions – personally, I wear an armband which indicates that I have a visual impairment and I tend to surf a little apart from other surfers to give myself sufficient space. You could also look into organisations which specialise in accessible surfing, such as Healing Waves on Jersey and Surfability in Swansea. Enjoy!